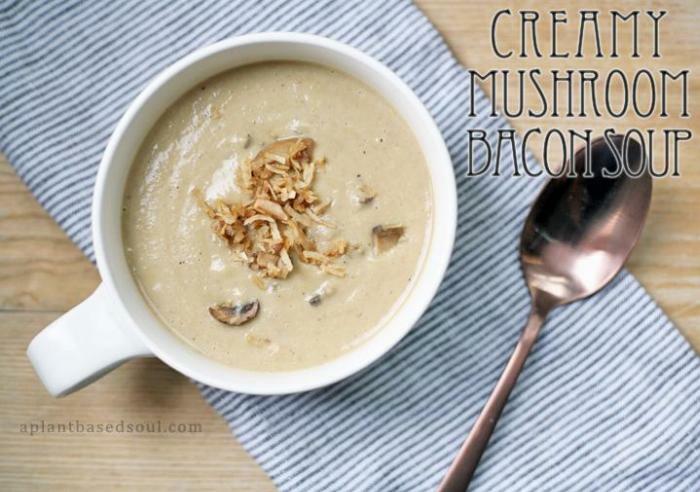 A dairy free soup made with mushroom bacon that is very creamy, extremely flavorful, nutritious, and easy to prepare. 1Chop mushrooms and onion. Set aside. 2In a large bowl, toss mushrooms with soy sauce, maple syrup, and liquid smoke. Stir to coat. 3In a large soup pot, sauté mushroom mixture with chopped onions and minced garlic over medium heat. Continue to sauté until onions are soft, about 5-7 minutes. 4Meanwhile, add remaining ingredients to a blender. 5When mushroom and onions are translucent, add everything from the pot (including any liquid) to the blender and blend on high until smooth and creamy. I started with 1 1/2 cups of almond milk and added a little more, 1/4 cup at a time until I achieved the right thickness. Because mushrooms and onions vary in size, the amount of added milk may differ. 6Return to the soup pot and heat on low heat until warm, about 5-10 minutes. Stir frequently.